Elwood Harry's name is synonymous with the International Game Fish Association. Born in Lancaster, Pennsylvania, he fished the lakes and streams of eastern Pennsylvania and the waters of the Chesapeake Bay. After World War II, he developed an international aviation supply business -- a vocation that gave him the means and the opportunity to fish throughout the world. Harry became an expert tuna angler, winning scores of world class competitions and awards. In 1962, he became a Vice President of IGFA, then President in 1975, and was elected Chairman of the Board of Trustees in 1987. He guided the IGFA through a major re-structuring process, transforming the organization from a small, privately- funded association into a not-for-profit, worldwide membership association and information source for anglers, groups and the sport fishing industry. 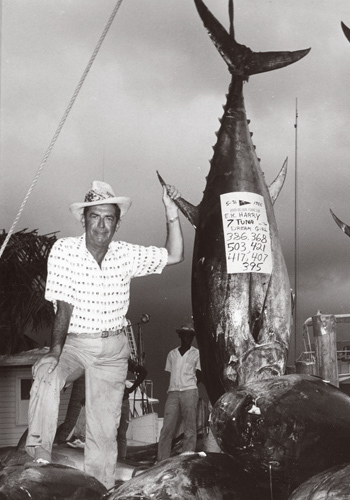 Under Harry's leadership, the IGFA gained a seat at the world table, helping guide international fisheries conservation policy. The organization developed one of the world's most extensive angling libraries, and expanded its world record book to include freshwater records--a job performed for nearly seven decades by Field & Stream magazine. Harry's legacy is an international sport fishing organization dedicated to supporting the interests of recreational anglers everywhere.